Disclosure: As a DaVinci Storyteller, I was provided with an all-inclusive trip to Tuscany, but am not further compensated for my partnership with them. All opinions and recipes remain, as always, my own. Have you ever had an experience that was so rich, so inspiring, so memorable that you spin your wheels trying to describe it? That’s exactly the predicament in which I find myself as I search for the words to tell you all just how “allofthosethings!” my trip as a DaVinci Storyteller was in late September. When I settle down to it, I get single phrases rather than full blown thoughts. The snippets come in fast and furious -“green”, “pastoral”, “people”, “vistas”, “history”, “FOOD”, “wine”, “architecture”, “culture”, “art”- but combining them in any way seems to do an injustice to the incredible beauty and depth of all of them. 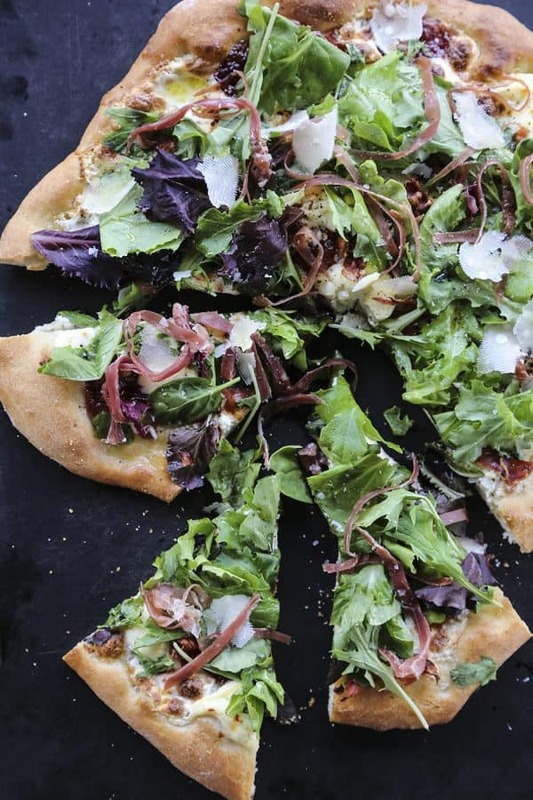 I’m going to have to settle for trying to illustrate myself through food, which is no sad compromise, most especially since I am sharing a pizza inspired by my trip: Figgy Pig Pizza – Tuscan Style Prosciutto, Fig, & Greens Pizza. 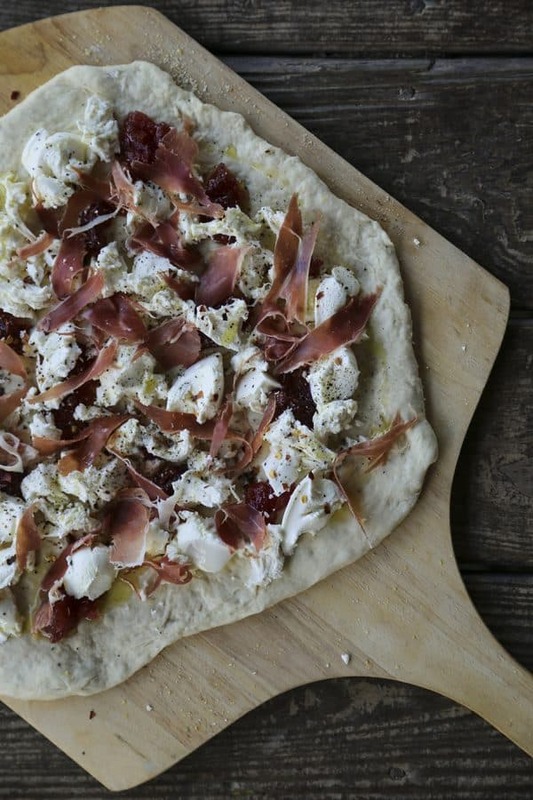 It doesn’t get much more Tuscan than prosciutto, figs, and pizza! This perfect blend of salty and sweet is as delicious as it is unique. While staying at the beautiful Casale di Valle, our trip coordinators arranged for us to learn to make proper Italian pizza dough and bake our pizzas under the tutelage of Chef Franco Venturini and his assistant Engjellushe. They led us through the process and helped us cook our pizzas in a wood-fired oven. To say that it was awe-inspiring to eat these pizzas with a glass of DaVinci Chianti sitting in the courtyard of a 16th century hunting lodge built by a nobleman who married into the Medici family, looking over the rolling hillsides covered with vineyards, olive groves, and cypress trees is like saying that it contributes to your longevity if you breathe. 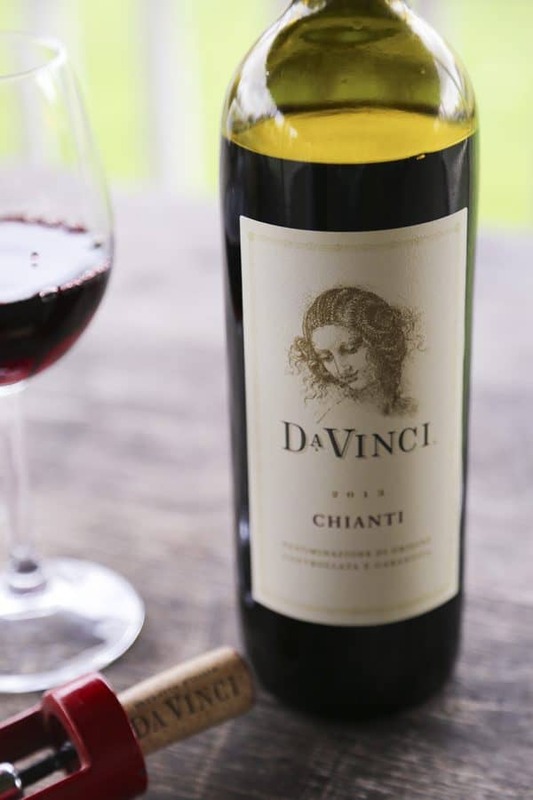 The DaVinci Chianti -with its bright notes of plum, black berries, and just enough acidity- was the perfect foil to our pizzas. My fellow Storytellers –Brandon, Molly, and Alana– and I decided that we would coordinate our efforts and have a fabulous virtual pizza party to commemorate this beyond-memorable trip. 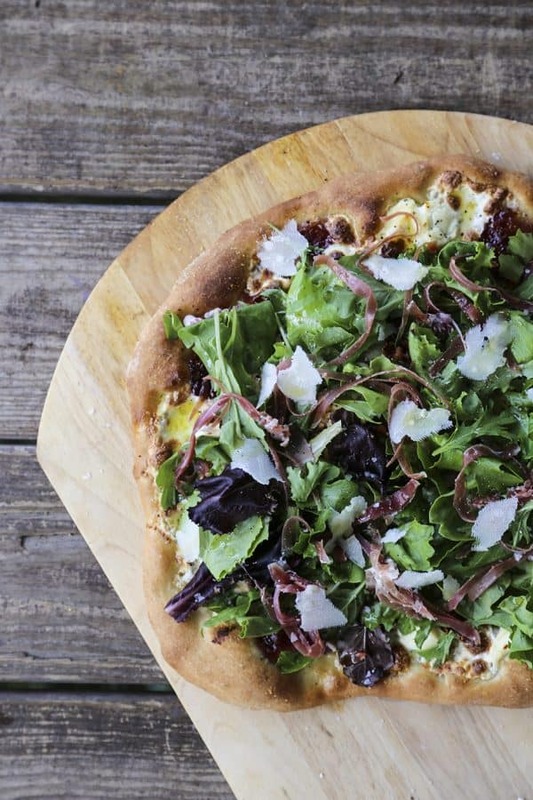 Be sure to pop over to their blogs to check out their amazing pizzas! If you’d like a sneak preview, scroll to the bottom of the post to see their gorgeous pizza pies! 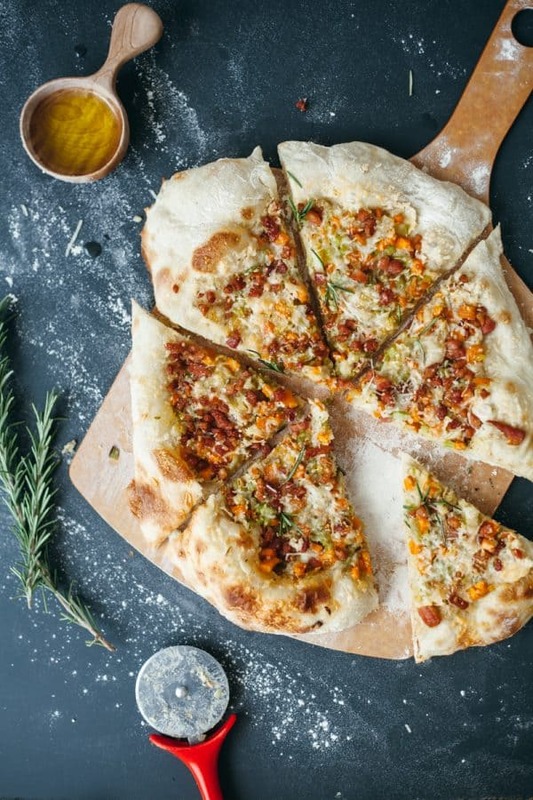 I am including my version of the pizza dough made by Chef Franco and Engjellushe, but if you find that intimidating, please feel free to use a purchased dough. You will notice there is a little give in the amount of water you use in the dough. This is because 00 flour absorbs water more readily than all-purpose or bread flour, and so needs less of it. If you’d like to try 00 flour for the full Italian experience, you can order it through Amazon.com. Be certain that your oven is fully preheated before sliding the pizza onto the peel or it will not cook in the tested amount of time! A word of caution: please check to make sure your dough is not sticking frequently as you add toppings to your crust. You do this by shaking the peel gently from front to back and back to front. If the dough moves freely, you are in good shape. If it sticks in one place, it’s better to know early in the process. You can gently lift that area, scatter more cornmeal or semolina underneath, and then rearrange your toppings. This is far easier than trying to salvage a pizza that flipped upside down on a 500 degree stone because one part stuck to the peel. Trust me. That’s a hard learned lesson! 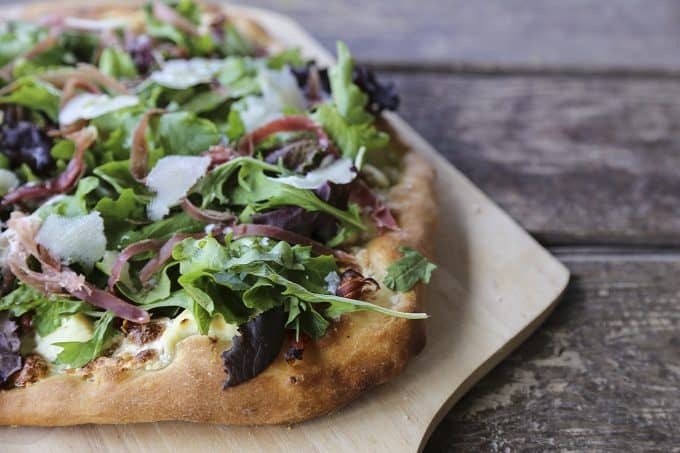 I know that it doesn’t seem like we’re putting many toppings on our Figgy Pig Pizza – Tuscan Style Prosciutto, Fig Jam, Greens Pizza, but that’s by design. The ones on here play very nicely together and aside from that, if we overload the crust, we will risk it sticking to the peel or the toppings keeping our crust from cooking through to perfection. 1/2 cup whole milk fresh mozzarella You can use homemade! Add the flour to a medium sized mixing bowl and create a divot or well in the center of the flour. Use your fingers to mix together the yeast, sugar, and 1/2 cup of the tepid water in a separate bowl. Pour the yeast mixture into the well in the flour and drizzle the olive oil around the edges. Use your hands to stir the mixture in a circular motion until a shaggy dough forms. If the dough holds together, you won't need the extra water. If it needs a little help becoming cohesive, drizzle in 1 tablespoon of water at a time, mixing, until it holds together. Flour a countertop and turn the dough out on the surface, kneading until it becomes smooth and elastic. You may scatter additional flour if needed to keep it from adhering to the surface of the counter. Form a tight dough ball by stretching the top under the ball of dough, turning a quarter turn clockwise and repeating until you have a smooth ball of dough. Place smooth side up in the same mixing bowl you used to stir it together. Cover with a tea towel and let rise for 2 to 3 hours in a warm, draft-free place. Preheat oven to 525F with a pizza stone or steel on the center rack. Dust a pizza peel with cornmeal or semolina. Set aside. Flour your work surface lightly and roll out the pizza dough until it is quite thin. Gently lift onto the peel and shake gently back and forth to be sure it isn't sticking. If it is, carefully fold back the area that is sticking and add more cornmeal or semolina. Keep testing the dough from time to time as you add toppings. Tear up 2 pieces of prosciutto into bite sized pieces and scatter over the dough. Dollop 2 teaspoon sized amounts of fig jam around the surface of the dough. Shake to be sure it isn't sticking. Repeat with the whole milk ricotta, then pull knobs of fresh mozzarella about the size of the top joint of your thumb from the ball and scatter them evenly over the crust. Grind fresh black pepper over the top, add a generous pinch of coarse sea salt and drizzle with extra virgin olive oil. 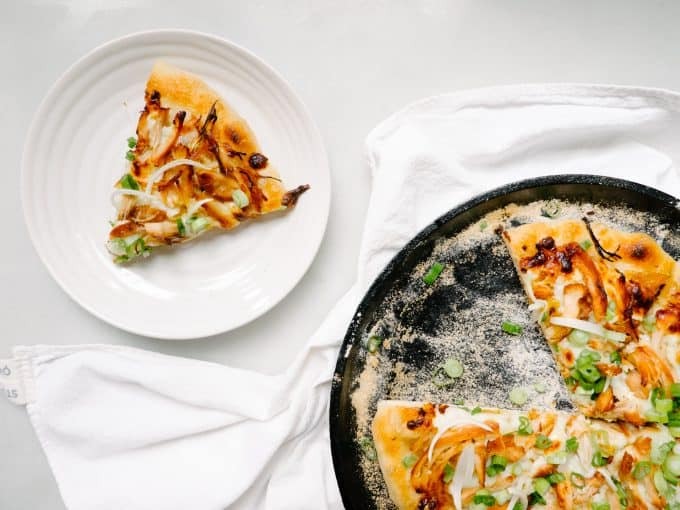 Slide the pizza carefully onto the peel and bake for 6 to 10 minutes, or until the pizza crust is bubbly and deep golden brown and the cheese is melted and bubbly. Use the peel to pull the pizza from the oven and transfer to a cutting board. Let it cool 8 minutes. 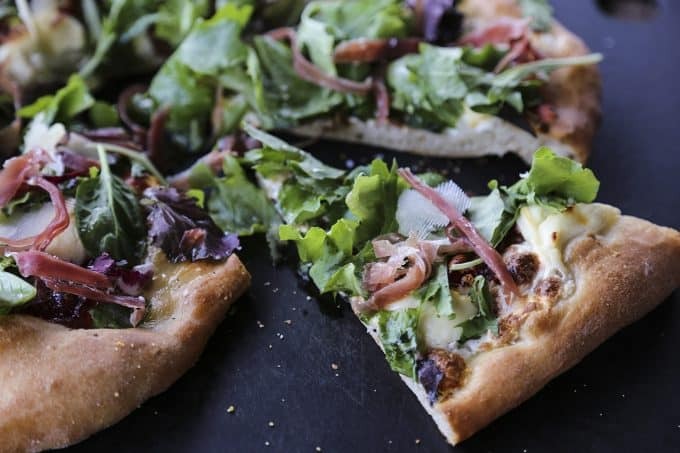 Cut the remaining prosciutto into thin strips before topping the pizza with the mixed greens, strips of prosciutto, curls of parmesan cheese, and another sprinkle of coarse sea salt. Slice and serve! 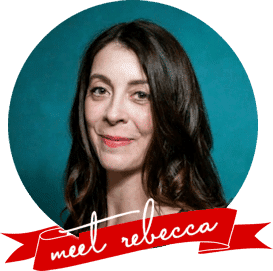 Rebecca, I love this pizza. Actually, this is a pizza I’d eat every week. 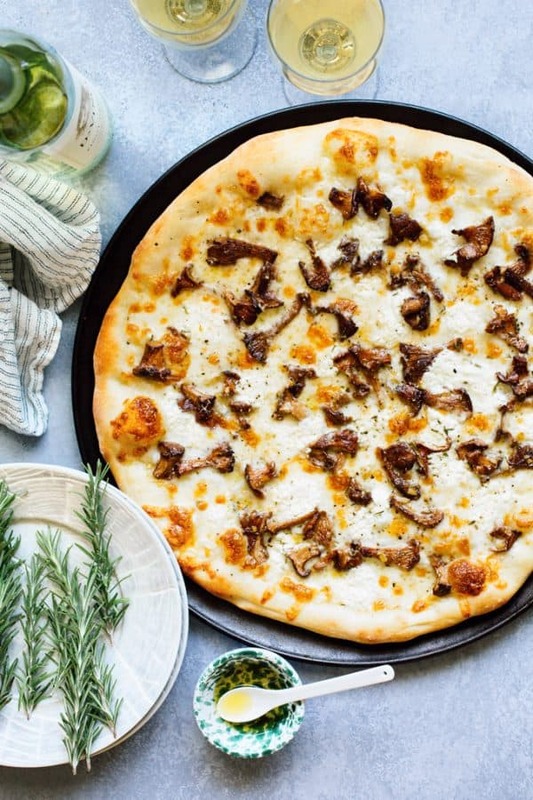 While I wish we were all sharing these pizzas in Tuscany, watching the sun dip down below the hills, it’s seriously so much fun to see what everyone came up with back at home!! Pizza party this time, next year? Can this be a tradition!? Thanks so much, Alana! I agree it’s fun to see what we all took from our experience turned into pizza! An annual pizza party tradition sounds wonderful to me! Your pizza is the winner – it’s the one I want to make. Pizza dough, in my experience, is just not that hard to make. I just made a pizza yesterday with Trader Joe’s fig butter – which works very well. I’m looking forward to trying this one. And I’m glad you enjoyed your time in Tuscany. Definitely beautiful country. Thanks so much, Susan! All the pizzas look wonderful, don’t they? I’m glad you want to give this a whirl. I love homemade dough, too! I second a yearly pizza party 🙂 Love the combination of fig and prosciutto here. I could eat this pizza all day long. I totally get that… so many times I’m asked how a trip was and all I can say is “magical” and that it was “beautiful” and that the food was “amazing.” But I guess that means that you really had an experience, one that you’ll hold onto for many years. Everything about it sounded wonderful. 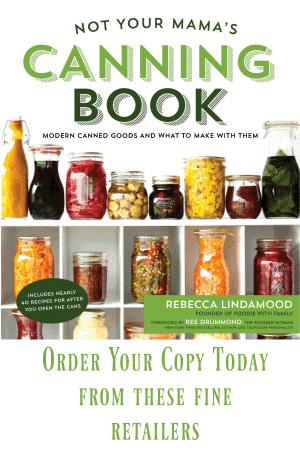 Creative recipe with tons of great flavors. Great job! This is heavenly pizza, my friend. The whole trip to Italy has sounded like the experience of a lifetime. How about you come back to Phoenix with a bottle of wine and we’ll re-make some pizzas? It might not be a trip to Italy, but I promise the laughter might be able to compete with the Italian scenery. You sure know how to tempt a girl! This sounds like so much fun! This looks AMAZING. I usually have homemade pizza dough in my freezer. 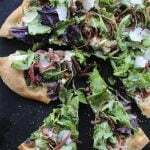 It’s the Now or Later pizza crust from King Arthur Flour. Will make this using my pre-made crusts until they are gone, then I will try this one. I will be having a “big-girl” overnight the Saturday after Thanksgiving. We are starting off the day (meeting at the crack of dawn) to go into Manhattan to see the Radio City Christmas Show and lunch in the city. Then back to my house for a sleep over and some fun. I think this will work out perfectly. This would make such a fun girls’ night pizza! That sounds like an absolute riot, Rie!